As the MLB season nears the one-third mark, there are important clues about which teams are in good position to reach October, and which ones are merely pretenders. The real baseball season is about to start. Those first two months? Glorified calisthenics. You can’t make a lasting statement in two months about how good you will be—unless you start 35–5, as did Anderson’s 1984 Tigers. All you can do is play yourself out of contention; we’re talking about you, Cincinnati, Colorado, Milwaukee, Miami, Oakland and Philadelphia. Truth is, you were pretenders right from the start. The Braves won the division by 21 games. I think about Sparky every year this time of the season. We’re nearly done with nearly one-third of the season, and we know very little for certain. The baseball season is a triptych. General managers work on one panel at a time: the first two months for assessment (despite the embers of Cole Hamels rumors that have been kept alive with bellows for the past seven months), the middle two months for acquisition, and the final two months to let it ride. We’re still in assessment mode. So I wondered if there were a way to prove or disprove Sparky’s Law. Do the first two months of the season serve us at all as a predictor of the playoffs? I searched for the answer in the standings after May 31 for the past 19 years—starting with 1996, the first full year of six-division baseball with wild cards. How many teams in playoff position entering June actually were there when it counted, at season’s end? The actual conversion rate from 1996 to 2011 with eight playoff spots at stake was 70.0%. If we retro-fit the standings for those years with 10 playoff spots at stake, the conversion rate drops to 67.5%. As you might expect, the second wild card brings more teams into play and makes it less likely a team will hold on to its playoff spot. Now here’s where it really gets interesting: the past three years, in which we actually used the 10-spot format. Combine the reality of teams fighting for more playoff spots with increased parity (the longest stretch without a 100-win team in the history of the 162-game schedule); increased revenue sharing; limitations on draft spending; the rise of regional sports network values and rights fees; and a severe downtown in offense (which keeps games closer and thus more in doubt), and the late, great Sparky Anderson was never more right than he is today. As far as predicting the playoff teams, the standings after two months are a bit better than if you flipped a coin: a conversion rate of 58.1% (18 of 31 teams). That’s right, the second wild card in each league and the parity-generating influences mentioned above have dropped the actual conversion rate from 70% to 58.1%. Sorry about that, Twins fans. • The American League East stinks. It held the worst cumulative winning percentage to start this week (.482). All five teams have held at least a share of first place—and lost first place. (Here’s the standings for most days holding at least a share of the lead: New York 26, Boston 17, Tampa Bay 8, Toronto 5, Baltimore 4. Don’t worry; it will change plenty more.) The Yankees went from last to first in six days. The Orioles and the Blue Jays took the elevator the other way—first to last—in four days. The best starting pitchers in the division—at least the only ones who ranked among the top 45 in ERA at the start of this week—are Chris Archer and Jake Odorizzi of the Rays and Ubaldo Jimenez and Wei-Yin Chen of the Orioles. The division’s starting pitcher talent drain over the past three years, by trade, free agency, injury or ineffectiveness, includes David Price, Matt Moore, Alex Cobb, James Shields, John Lackey, Jon Lester, Marcus Stroman, Hiroki Kuroda, Andy Pettitte, Chris Tillman, CC Sabathia and Clay Buchholz. The AL East winner has won at least 95 games for 14 straight years, with an average of 97.8 victories. That streak should end, unless you believe one of these plow horses is going to play better than .600 baseball for the remaining four months. • The Houston Astros, at worst, are the 2014 Brewers—which is to say they’ve banked enough wins in a mediocre division to get to September with a chance. Milwaukee started last year 20–7, which allowed it to go 53–56 in its next 109 games and still enter September tied for first. The Brewers sunk further with a 9–17 September, allowing St. Louis to win the division with just 90 victories. 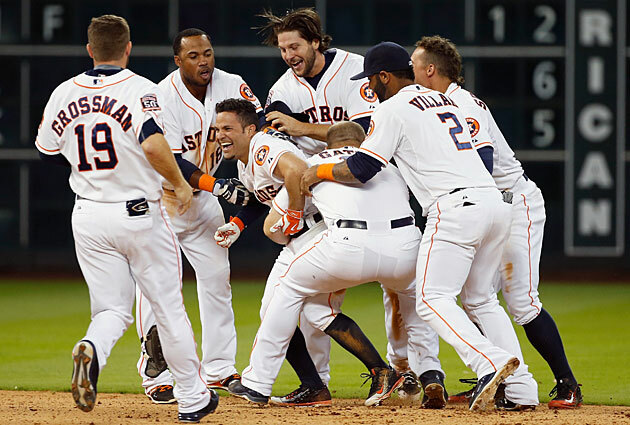 This year's Astros already have 29 wins, and they lead the AL West by 5 1/2 games. • The AL Central is the best division in baseball, with a cumulative .549 winning percentage to start this week and three teams in playoff position. Can three teams in one division make the playoffs? Yes. It happened in 2013, when the NL Central sent the Cardinals (97 wins), Pirates (94) and Reds (90). If Sparky is right, the NL will have all three of its division winners repeat for the first time in the alignment’s 20-year history. So circle next Monday on your calendar, and raise a glass of good cheer to Sparky. It’s Re-Opening Day.